Slot machines have been around for years, and they show no signs of slowing down or disappearing. 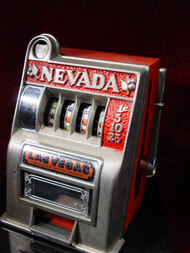 In fact, the number of slot machines available continues to expand and meet a variety of people's tastes and needs. These machines can typically be put into three basic categories, each with their own characteristics and traits. Even if these categories divide the machines up, there are several factors within each one that changes the outcome of each machine. For example, the payout may vary based on the number of payout lines or wild symbols. Basic, or classic, slot machines are ones that are typically three reels. What classifies them as basic is how the payout is determined. Since there is no difference in how often the machine is played, the payout is always the same for everyone. Because of this, these machines tend to have more winners, but the amount that they win is relatively low. There can be a wide range of payout lines on a classic slot machine, but the most important one is to get the same symbol across the center. However, if you get three sevens across the reels at any time, you'll also win a prize. These payout lines are determined by how many coins you put into the machine at one time, meaning that the maximum bet will have all payout lines covered. Unlike classic slots, progressive slots pay a different amount for the jackpot based off of how many people play the machine. Simply put, the more people gamble at that machine, the higher the jackpot will be. These machines offer a huge reward for players, and usually display the current total somewhere on the machine. Once someone wins the jackpot, the money will go back down to a set amount, where it will continue to grow as more people play it once more. A progressive slot machine also requires a player to be the maximum number of coins if they want to win the entire jackpot, meaning there is a huge payoff for the risk. While these machines do not have too many winners, the incentive lies in the one person who does win it. Unlike the classic machines, other people's losses can quickly become your benefit. The third category for slots is the video slot machine, which is a more technical version of slots. These tend to have are more visual experience for the player, resulting in a much more entertaining outcome. These can be found both online as well as in a physical casino. They have their own rules, so be sure to read the rules before you start playing a video slot machine.